Some people are known to develop a love for their community only when certain measures are implemented. Indeed, they become happy when infrastructures such as roads and those for electricity, telephone and water services become available, and happier still when security becomes optimum. But there are those among us whose love for their community come from teaching others to become so socially conscious that they themselves begin to develop a mindset that helps to improve the environment in which they exist. Moreover, it certainly isn’t an easy task to look at what is commonly referred to as a “depressed” or “vulnerable” community and envision outcomes that could help to change lives for the better. 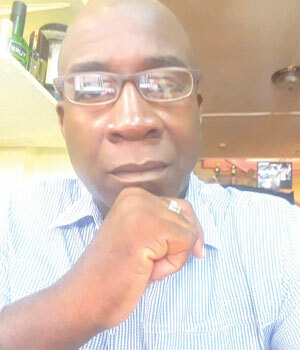 However, it is just this that Colin Marks has been doing for close to a decade – implementing and joining initiatives to help transform the lives of people, especially youths, in a community where many thought no good could emerge. Imagine for instance, a neighbourhood so depressed that parents threaten to export their children there when they become too difficult to manage. You can also dare to envisage that area as one where the only thing people can readily call to mind about it are a number of criminal activities. In fact, the sprawling catchment area in question, which cost millions of dollars to be deforested so that even more people could be become homeowners, is so misrepresented that instead of being called Pattensen, it is merely referred to as Sophia, one of its smallest sections. It was this community that Marks dared to bring his social consciousness to, back in 2000. He did not only try but realized a transformation that has been so significant that it has today helped to change its social fabric for the better. By being a part of many social initiatives intended to bring about community upliftment, Marks worked tirelessly to help make the community he called home, a place where people could yearn to be their best selves and not merely adapt to the stigma forced upon it. Today, Pattensen is not only a more well developed community infrastructurally, but it is well known for many things, good things, and not merely those of a criminal nature. A collage of Colin during his Rastafarian days and his children. Sharing social consciousness with some youths. But the evolution is still taking place. “I am getting happier because the process is still ongoing. We have just passed the embryonic stage and we can throw off that yoke of being neglected but there is still more to be done,” said Marks. It must however be noted that Marks wasn’t always this interested in community development. In fact, there was a point in his life when he was just a radical. Born Colin Andrew Marks on July 12, 1964 he remembered being raised in the East Ruimveldt Housing Scheme and then Charlestown, Georgetown. 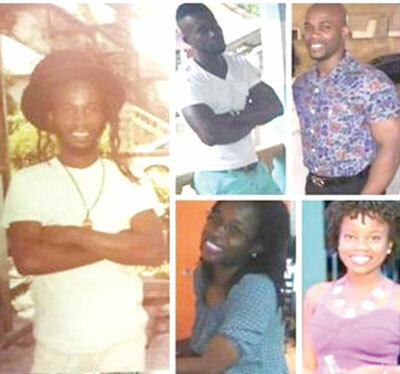 His parents, Dolores and Colin Alphonso Marks [both deceased], who hailed from Essequibo, had five children of whom he was the penultimate. Their upbringing was certainly a strict one. Marks, during an interview, spoke of attending church regularly and even recalled being an altar boy. Education was also an important aspect of his young days. He recalled that this was long instilled in the family since his paternal grandfather was a well-known School Master. “I remember my eldest aunt speaking about School Master Marks,” Marks fondly reminisced. But although he didn’t know the man himself, his father didn’t waver to make education a priority in his children’s life. For Marks, education was second nature. He attended the St. Stephen’s Primary School and then the East Ruimveldt Government School and was at the top of his classes when time came for him to write his final examinations. He was all set to write eight subjects and his parents were already confident that he was smart enough to study to become a lawyer or a doctor. But as fate would have it, Marks got caught up with reading literature about Rastafarianism and decided he wanted to learn more about that instead. To do this, he opted to quit school altogether. “I guess I was hurting my parents…I had to decide whether I wanted the locks or my subjects and I chose the locks,” recounted Marks. With his loving wife Nicola. 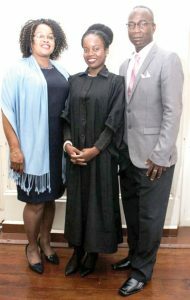 Colin and his wife flank their youngest daughter as she admitted to the Bar. “I told my father I didn’t plan on pushing any paper to get any job because my education was in me. Such was my rebellion,” he related. Of course he had to find alternative living arrangements since he was no longer welcomed in the Marks’s home in Charlestown. 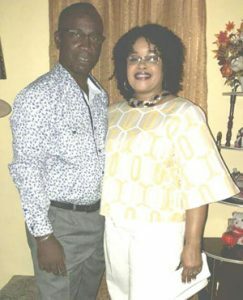 Although he got temporary accommodation at his aunt’s home in East Ruimveldt, it wasn’t long after that he was heading to Berbice to live off of the land. Although he became good at farming, he yearned to return to his father’s home and, much like the prodigal son, he did with his dreadlocks in full bloom. He was not turned away but rather stayed around and even helped his father grow his blueprinting business. Although he left for Linden for a short while to do some more farming, Marks returned and essentially took over the reins of his father’s business. “I think he was happy that I was still reflective of a good upbringing,” said a smiling Marks as he reminisced on this rebellious days. But it wasn’t all about the business. In fact Marks was a force to reckon with in entertainment; after all he had the vocals of an award winning artiste. Of course his preferred genre was reggae and he utilized it well when he decided to join a band and even did some solo performances. It was during one of his singing gimmicks that he would set eyes on a pretty young lady named Nicola Duncan who later became his wife and mother to his four children – Coeytito Akintyo, Coel Akanni, Conika Ayodella, Collette Ayoka. But being a family man meant that he had to take life a bit more seriously. Moreover, Marks, with the support of his wife, jumped at the first opportunity to construct their own home when they were afforded a piece of land at Pattenson. The area, at the time, was very underdeveloped but Marks certainly accepted that owning his own home was definitely more financially feasible than renting for the rest of his life. However, deciding to move to such a location as Pattenson back in the day meant that he and his wife had to wean their children off of the luxury of having easy access to lights, water, and even roads. Even as they built their home, over a period of time, Marks and his wife would bring their young children to spend time at their home during the weekends just so they could adapt to the conditions they would soon be forced into. There were days, Marks recalled, that they slipped and fell along the mud path to their home but this certainly was not a deterrent. “We would come here and bring our children and explain to them that these were the conditions they would have to get used to…we even named a spot after my wife where she fell down a few times,” said Marks joked. By the time he’d moved his family into their new home, Marks, who had already assessed his community, recognized that there was a dire need for a social transformation. “Right away I started with this social consciousness in my new community,” said Marks a move that was triggered when he saw young men gambling and loitering around the community. “I immediately recognized these youths needed an alternative and I wanted to help find that alternative for them,” Marks shared. He wasn’t alone. Already some residents of the community had formed a group and invited the likeminded Marks to come on board. 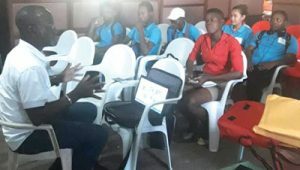 Although through the group he was able to reach out to a number of youths in the quest to help them engage in activities to steer them in a positive direction, it wasn’t until after attending a strategic workshop that he understood the magnitude of situation in the community. At the workshop, which saw another community-based organization affiliated with a church collaborating with the then Guyana HIV/AIDS Reduction and Prevention Programme [GHARP 1], that Marks along with others were sensitized to the community about the HIV situation in the community. “When I heard a doctor say that ‘Sophia’ had just beaten off another community in terms of AIDS cases, I decided I had to start a youth club myself to get the youths more aware,” Marks disclosed. This saw the formation of the Pattenson Youth in Action Club. Serving as the Chief Coordinator of the Club was Marks’s youngest daughter, Collette Ayoka, who is now a practising attorney-at-law. He disclosed that in order to be efficient in the Club his daughter was trained by the Youths of Sophia Outreach Project – WISE UP, the organization affiliated with the church. “They were doing a lot of HIV work in response to what was happening and we wanted to help too. This place was evolving and I was sort of becoming a community connoisseur,” Marks noted. He was instrumental in the realization of the Pattenson Community Centre where many youths are kept focused on a positive path. He is currently helping youths of the Pattenson community use information technology to help transform the image of their community. But in the early days a great deal of work needed to be done but there were little resources to do so. He recalled, too, that the community was also plagued by other challenges such as sexual and physical violence and neglect. Marks disclosed that it was found that of every 100 pregnancies at least 35 were girls below the age of 17. “I decided I needed to work from the top…reach the men and the women and then work down to the youths,” said Marks who certainly wasn’t alone in engaging transformation measures. He recalled working closely with a number of organizations including the Red Cross and Help and Shelter to name a few, that have had a hand in helping to build capacity to improve the community. According to Marks, who is currently a Board Member at Help and Shelter, and continues to do many other community oriented programmes, the Pattenson area has over the years been used as a study specimen for many a university students and has been a venue for many a focus group discussions because of the myriad of daunting issues it faced. It was with the unwavering efforts of people the likes of Marks that saw the psyche within the community changing for the better. This, of course, materialized after deliberate efforts were made to, not only detect the social maladies in the community, but also to identify the needful mitigating factors. “I saw the need to get the young people to help identify these factors and raised their awareness and expand their knowledge,” said Marks. He has overtime been able to expose many youths to alternative activities that have served to develop them into productive human beings. “I have seen youths I have worked with become things that they never imagined they could be,” said Marks. Although the many efforts plugged into the Pattenson area have catered to its positive transformation, Marks is convinced that there is even more to be done to. And he certainly is continuing to lead the way. “If this community wants to continue to improve, it has to come from social evolution…I keep telling the youths it has to come from them,” said Marks. For his continued drive at community development, today we at Kaieteur News bestow Colin Marks with the title of our ‘Special Person’.